Hand Stamped By Heather Wright-Porto: Th Blog Tour is Over but Projects Remain....Hope You Had Fun! Th Blog Tour is Over but Projects Remain....Hope You Had Fun! Although this past blog tour (May 15th and 16th) is now over, here are the projects that were featured! While visiting my stop on the tour you will notice the following samples and projects feature the beautiful Baroque Motifs stampet, as well as the Parisian Breeze Designer Series Paper and the Pretties Kit (all from Stampin' Up!). This next card is actually Card #3 from the April Class Kit. Instructions and more detail to be posted soon now that the blog tour has finished! This card can be used for any occasion! It contains small, clear rhinestone brads from the Pretties Kit (or you can now purchase Clear Rhinestone Brads as well and separate from the Pretties Kit), two patterns from the Parisian Breeze Designer Series Paper, Brushed Gold cardstock, the Baroque Motifs stamp set and the use of Chocolate Chip CRAFT ink. NOTE: I used Craft ink because the Parisian Breeze Designer Series Paper is think and textured and the Classic ink did not show up or stamp well on this paper. The Craft ink worked well - but allow more time to dry! You may also use the 1/16" Circle Handheld punch or a piercing tool (from the Crafter's Toolkit) to pierce the holes for the rhinestone brads. Lastly the Tearing Tool was used to tear the paper on a slant, however many people can tear by hand beautifully. This next project is a Father's Day project. It contains many layered background stamps in Chocolate Chip Classic Ink and Blue Bayou Classic Ink (can use Taken with Teal or Baja Breeze or other desired inks). But most importantly it features the Baroque Motifs small flower and swirls in Chocolate Chip CRAFT ink. NOTE: Again, Craft Ink was used since it would appear darker and more clear on the wooden frame. You can noticeably see the difference between the two browns used - Chocolate Chip Classic Ink and Chocolate Chip Craft Ink. In the upper, right corner I also used rub-ons (Chateau Bella) as the greeting, however you could also stamp a greeting (recommended in Chocolate Chip Craft Ink). This cute wooden basket is decorated with Parisian Breeze Designer Series Paper, ribbons, a silk flower and clear rhinestone brad from the Pretties Kit. I stamped the small flowers from Baroque Motifs using Chocolate Chip Classic ink and Blue Bayou Classic Ink, and using the Rock-n-Roll technique. The large swirls were stamped in Chocolate Chip Craft Ink. 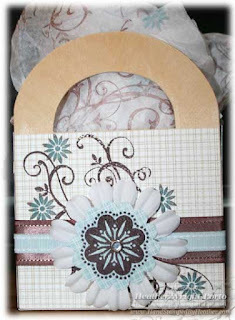 The medium flower is stamped in Chocolate Chip Craft Ink on a blue patterned piece of paper from the Parisian Breeze Designer Series Paper pack, and then punched out using the Scallop Circle punch. The tissue paper is also stamped!!! This small, 3x3 card is cute and simple. 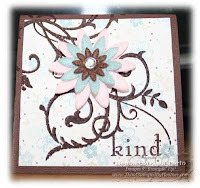 I stamped the swirl and "kind" in Chocolate Chip Craft Ink on top of a floral pattern piece of paper from Parisian Breeze. Then I used a Clear Rhinestone brad and felt flowers from Flower Fusion Too and adhered them to the card front using a Pop-Up Glue Dot. 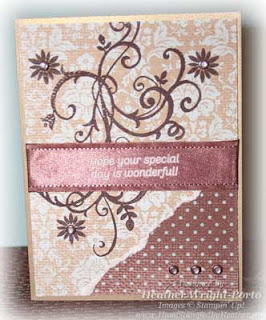 To see more samples of cards and projects featuring Baroque Motifs, click here. Heather, everything is beautiful but I especially love that frame. What a beautiful picture too! I'm inspired to try a frame of my own too. Hope you have time to stop by my blog.. I'm number 20! 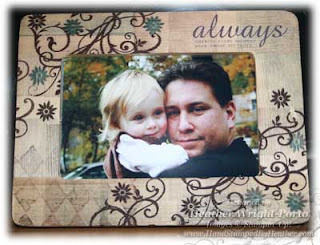 Yes, that is my favorite picture of my husband and daughter - just love it and had to make something special for it...and with Baroque Motifs being my favorite stampset and chocolate chip being one of my favorite colors, it was a perfect fit. Thanks for visiting and I will be sure to visit your blog on the tour! Thanks again and best wishes. Heather: Your work is so beautiful. I just love everything you made. And what would we have done without all your help. Thanks for all you contributed to the blog tour. I love that frame! What a fabulous picture of your munchkin and your hubby -- there is so much love showing in that frame that it automatically made me go, "Awww!" I'm definitely going to have to case that dude and can't wait to get the supplies to give it a try. Thanks for the inspiration -- love this set but find my fingers don't do too much with it. Now I've got some great ideas! I don't have this stamp set but after seeing your page, I think I may have to go get it! Thanks for sharing. I love your art! loving all your projects girlfriend, especially the father's day frame, that rocks. How beautiful! And I think this set is so versatile and precious. It adds such charm and elegance to a project. Such gorgeous creations! I love this stamp set and you showcased it beautifully! These are lovely cards - so graceful. Colors are great! I especially like that beautiful frame! Loved the frame (your daughter is beautiful) and the tissue paper is stamped! You are just amazing. Loved it all. Thanks ladies for visiting my blog on the tour! Heather, I have to report that I TOTALLY cased your frame project. Here is my project with some minor changes. THANKS so much for wonderful inspiration. I just wanted to thank you for leaving a comment on my blog last weekend during the tour. I appreciate your taking the time to do so!! What a wonderful stamp set. Thanks for sharing.